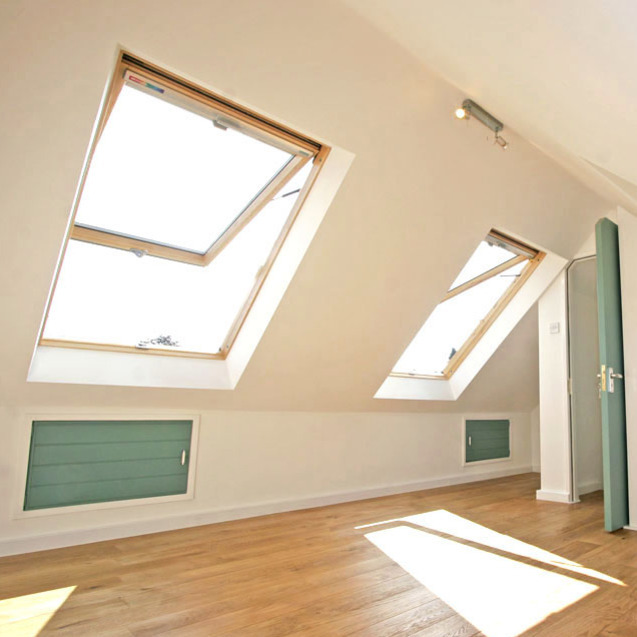 The Loft Access Company can supply and install a wide variety of different stylish roof windows and skylights. Whether your home is modern, traditional or a listed building, roof windows can be installed into most sloping roofs to create bright and airy living spaces. 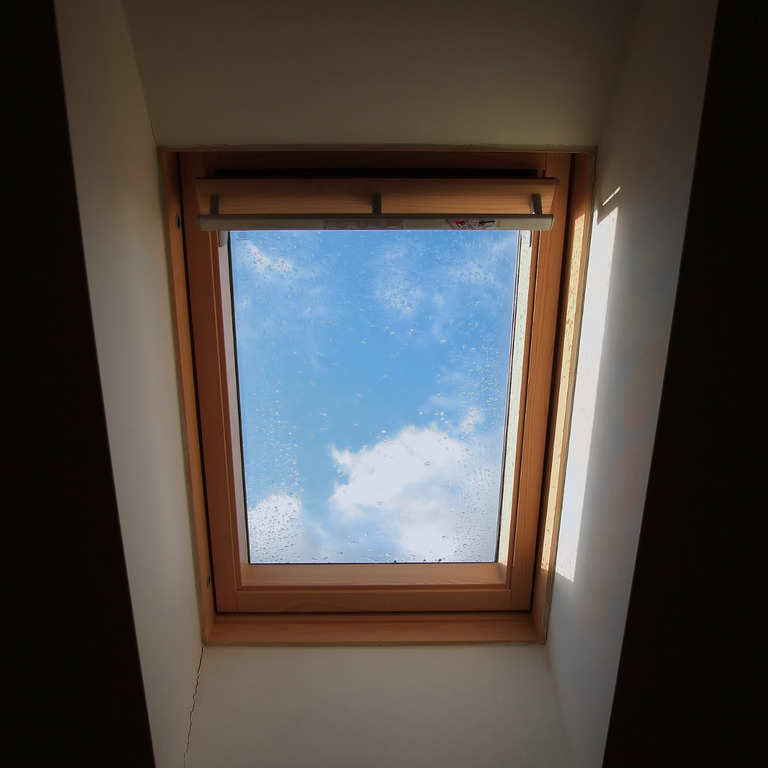 There are a number of different brands that specialise in roof windows, and here at The Loft Access Company, we are proud to provide alternatives from all. Roof windows are dependent on degree of your roof pitch, but can generally be installed into any sloping roof. It's also important to remember how easy to reach they will be once installed, and what their purpose will be - for example, additional light to a ultility area or as part of converted loft space meant for the master bedroom? Combinations of vertical or fixed roof windows can also be installed to create brilliant living spaces. 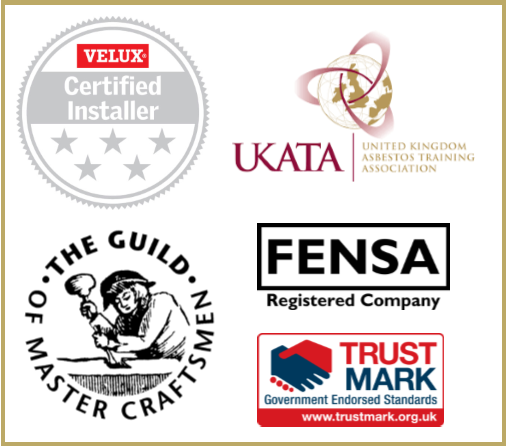 The Loft Access Company are Certified Installers of all VELUX products, the number one leading international roof window suppliers with the most state-of-the-art designs. WHAT IS A ROOF WINDOWS? The centre pivot roof window by VELUX is most versatile of all roof windows as it can be installed into any sloping roof with a pitch between 15° and 90°. Operatable by a single handle located at the highest point of the window top, an initial short pull downward opens the ventilation flap, a further gentle pull opens the window fully. Available in three finishes; White Painted, White Polyurethane and Pine. Commonly used in low pitch roofs, top hung roof windows by VELUX are excellent for creating wide and unobstructed views. This window opens outward, facilitated by rotating the handle at the bottom of unit. A gentle push upward opens the window fully to 45°, an operation made easy by the powerful pneumatic struts. Due to the unrestricted opening area, the larger frame sizes are also suitable for fire escape purposes. Although hinged at the top, the Top Hung Roof Window retains its ventilation flap and centre-pivoting hinge for cleaning purposes. For awkward to reach places and high ceiling, roof windows operate by remote are an easy solution to a tricky stretch. Powered either via electricty or solar energy, you will have full control of your VELUX roof window with fully integrated motor system that is operated by a portable control pad. With an easy-to-use touch screen and swipe function, this intuitive control pad is programmed with a number of different pre-defined ventilation settings so you'll be able to automatically create the perfect atmosphere whatever the humidity. The Conservation Window unit is designed to accommodate the renovation of traditional buildings, when planning dictates that a window of traditional external appearance is required. With a black external profile, the standard pine frame has a lower fixing position in the roof to achiever a more streamlined effect. 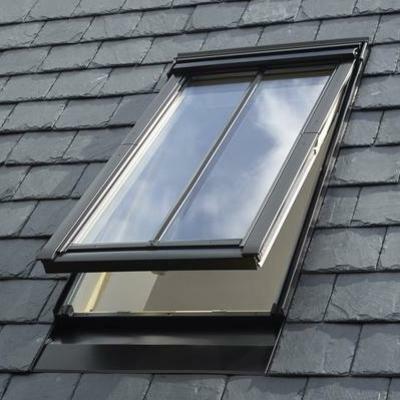 Supplied with a central glazing stip, the Conservation Roof Window is available in both with a centre pivot and top hung operation bar, with a ventilation flap and centre-pivoting hinge for cleaning purposes. The window therefore operates in the same manner as its equivalents, with a handle at the top to open and close the window. The VELUX range of flat roof windows open up your home to masses of natural light in a unique way. 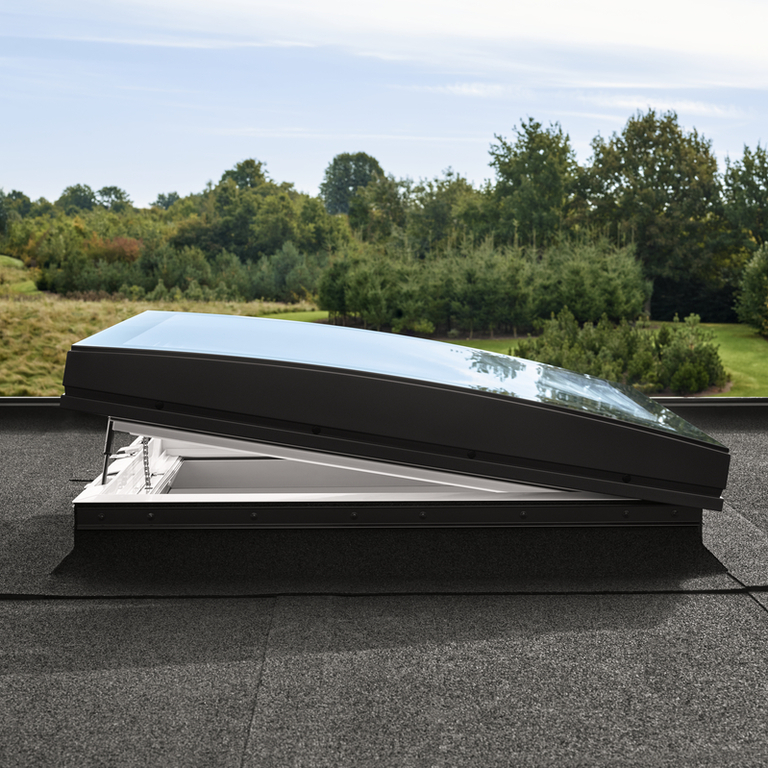 The Curved Glass Rooflight featured in the image above is the newest addition to the flat rooflight range. This innovative design of 6mm glass-to-edge glazing is a stylish approach to natural light, the curved glass providing a unobstructed view of above. The low-energe pane is also highly insulated, and the automated option also comes with an electric ventilation system. Fixed units, domes and emergency escape rooflights also available. Sun tunnels are a brilliant way bring natural light into spaces where neither traditional nor roof windows can reach. 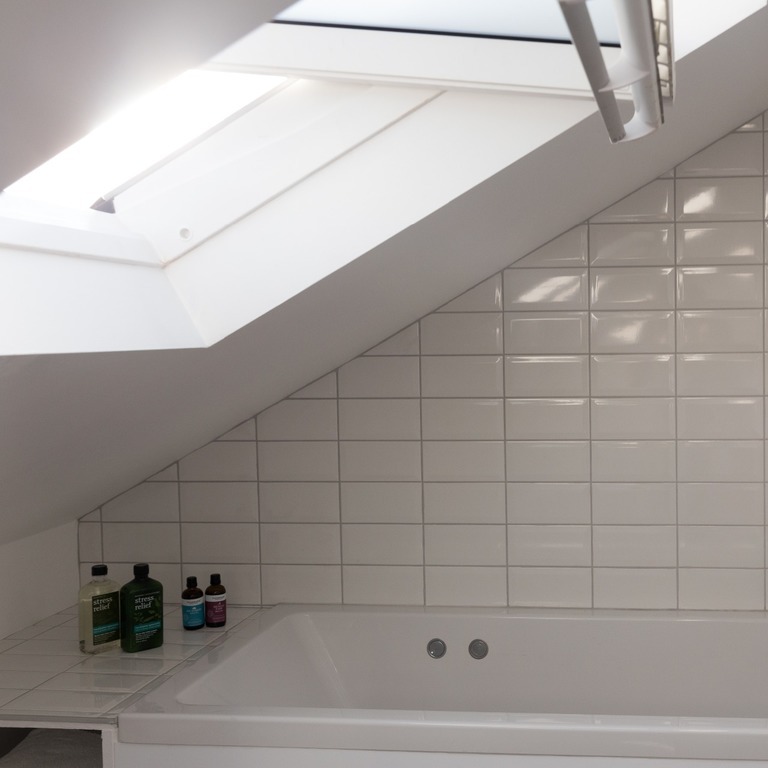 Internal, window-less rooms such as bathrooms are where sun tunnels make a difference most. Stretching from exterior roof, the tunnel reaches through the property (normally through the loft space) to bring light into room. 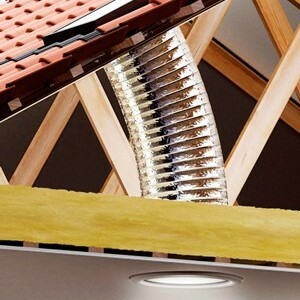 There are various diameters available, and the VELUX sun tunnels can be installed into both flat roofs and pitched roofs. The VELUX Cabrio Balcony can completely transform your interior, allowing you to enjoy the natural daylight and great views whilst providing the ultimate amount of fresh air. The upper section is top-hung, rotating outwards by 180° allowing for extra headroom, whilst the bottom half unfolds into a triple-glazed balony with side railings. VELUX Cabrio Balconys can create an excellent focal point for any room, but are stunning in their own right. Easily operatable, this is the most efficient way to add natural light, ventilation and a general feeling of openess to your loft space. With an easy to clean coating, all glazing has toughened lamination pane for additional safety. You can also pull the unique top control bar to allow you to enjoy fresh, filtered air through the ventilation flap. This will also improve the indoor climate by preventing dust and insects from entering your home. Check out one of recents projects Stunning Roof Window Conversion, Bray for a closer look at the Cabrio Balcony. 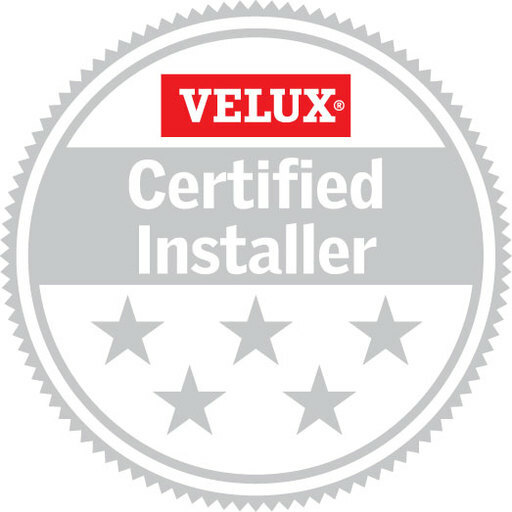 Just wanted to thank you and your team for fitting our replacement Velux window yesterday. Excellent and professional service – much appreciated. We are very pleased with the windows themselves and the installation work. Everywhere was left spotless! Thanks Again. Thanks for the work completed, I’m really pleased with the service you provided, and helping me to resolve all the issues that seemed insurmountable previously.